I'm looking for a reference that tells me how many recombenation events occur in humans from one generation to the next. Assuming that the human genome is a 3.3 GigaBases long DNA sequence, how many recombination events do you find, and what is he amount of DNA exchanged? Is it in the order of 0.1%, 1% oder 10%? The definition of the centimorgan is that it is the length of DNA in a chromosome corresponding to a 1% chance of crossover occurring. In human chromosomes 1 cM = approx. 1Mbp. 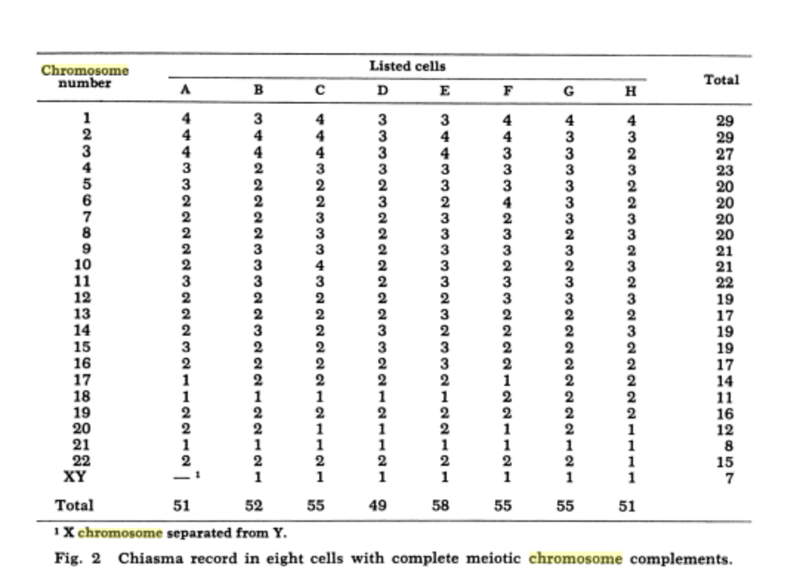 The average chiasmata per chromosome for each chromosome can be estimated by dividing the number in the final column by 8. These vary from (rounding aggressively) 3.5 for Chr 1 and Chr 2, to 1 for Chr 20. So my back-of-the-envelope calculation seems to have produced a reasonable answer. What is the amount of DNA exchanged? I'm not sure this question matches well with the picture that emerges from these numbers. "On average, between two and three crossover events occur on each pair of human chromosomes during meiotic division I" according to Molecular Biology of the Cell. 4th edition by Alberts B, Johnson A, Lewis J, et al. For simplicity we will call that 2.5 events per pair. Each of those pairs ultimately forms 4 gametes. Each event connects one chromosome to another, so each individual event will leave 2 chromosomes with a location where an event has occurred. That means that in the 4 chromosomes in 4 different gametes that are produced from any single pair, there will be (on average) a total of 5 locations where a recombination event has occurred. On average then, each chromosome will have 5/4 or 1.2 locations where a crossover event has occurred. Each human gamete has 23 chromosomes. Two gametes (1 egg, 1 sperm) unite to form an embryo. That embryo has 23 PAIRS of chromosomes, or a total of 46 (except in cases of certain chromosome abnormality). Therefore a first estimate would be that across a given set of 46 chromosomes, there would be 1.2 times 46, or 55.2 sites where recombination occurred on average. It is important to note that the question cites 3.3 Giga-basepairs in the human genome. While that may be a reasonable estimate for the size of one complete human genome, each human has two copies of each chromosome and therefore two complete copies of the human genome. Wikipedia states that this is currently estimated to be 6.5 billion basepairs (6.5 Giga-basepairs). This distinction is significant because recombination during gamete formation in females is significantly more frequent than in males, so the genome found in a human egg cell will have many more recombination events than a sperm cell genome, therefore the average is only applicable to the entire 6.5 Giga-basepair genome. The question about the "amount of DNA exchanged" through recombination is not really valid since total quantity of DNA in each of the four gametes produced in meiosis is exactly the same as the amount that had been contained in the original parent cell after DNA replication (but before meiosis I has produced two daughter cells). No base pair can be said to have been exchanged through recombination or not. Not the answer you're looking for? Browse other questions tagged genomics human-genetics chromosome human-genome recombination or ask your own question. How much variation in mutation rate in there in the human genome?